Annette Leslie is a mom who has been through the harrowing experience of losing her son to medulloblastoma in 2010. His extraordinary life and character inspired the Carson Leslie Foundation's inception that same year, in Dallas Texas, and launched her into a world of advocacy for children with cancer, pediatric cancer research, and working closely with legislators to promote the prioritization of pediatric research funding in a culture that is profit motivated and often neglectful of those most needy of a cure. Annette spoke at the 2010 Inaugural Summit for the Congressional Caucus for Childhood Cancer co-chaired by her Congressman, Michael McCaul, and in 2014 she began hosting the tradition of the Golden Toast to honor those key Congressional leaders responsible for supporting the continuing evolution of the childhood cancer awareness movement into laws that ensure that the leading disease-related cause of death in children in the United States will receive adequate research funding, and affected children will receive adequate care and support. The Carson Leslie Foundation is dedicated to collaborative research for pediatric brain cancer and supporting children and the quality of life that they enjoy with their families with special events and programs. 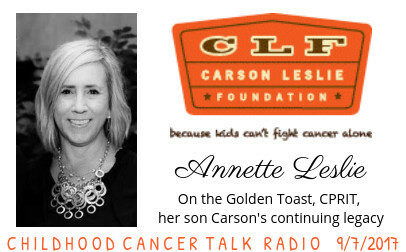 Annette looks forward with us to the 8th Annual Summit for Childhood Cancer with the Childhood Cancer Caucus and the Golden Toast which celebrates our greatest heroes for kids in Congress, on Thursday, September 14th at 9am in the Rayburn House Office Building on Capitol Hill. Those interested in any way in childhood cancer awareness in the Washington DC metropolitan area are warmly encouraged to attend. For more information about the summit, visit www.childhoodcancer-mccaul.house.gov. Discover the latest triumphs of the Carson Leslie Foundation and their work with CPRIT, the Cancer Prevention and Research Institute of Texas, shared in this podcast, at www.carsonlesliefoundation.org. Carson Leslie's book "Carry Me" was published 6 days before his death in 2010, and it continues to supply unique inspiration and unparalleled support to children with cancer and their families. It can be found on the foundation website. Jack began to have unsettling symptoms at the age of 3; he was taken to Children's Hospital Los Angeles and was diagnosed with DIPG, or diffuse intrinsic pontine glioma, on Friday Oct. 28, 2011, indisputably the darkest experience of Janet's life. The outrage of it made her determined to find the good in the situation, and she asked God to "Put me to work!" After Jack's death, she remained determined to start working to find solutions to DIPG and incorporated Jack's Angels at the end of 2012; the Foundation began its work in 2013. Despite the fact that DIPG is responsible for the majority of brain tumor deaths in children, she had been told there were no solutions for Jack because "the numbers aren't great enough for investors." This remains the primary motivation in her advocacy work, to prioritize children's lives in our medical system in the United States.